Vienna is a city packed with high-Baroque and Historicist churches - modern architecture is usually of the profane kind or non-Catholic, thus often less elaborate and prominent in Austria. One noteworthy exception is the Wortrubakirche Church in the southern (and generally unexciting) district of Liesing. The official name of the Wotrubakirche is "Filialkirche zur Heiligsten Dreifaltigkeit Mauer". 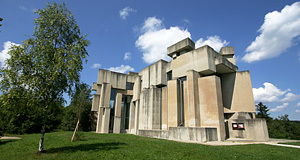 The Wotrubakirche Church was built between 1974 and 1976 according to plans by the Austrian artist and sculptor Fritz Wotruba. It consists of 152 naked blocks of concrete that are arranged in a seemingly loose way, opening gaps that are filled with glass and that allow light to enter the building. The design of the artist Wotruba was made a technical plan by the architect Fritz Gerhard Mayer, who usually remains unmentioned (the hook about working with a famous artist as the mastermind). Fritz Wotruba himself died in 1975 and could therefore not participate in the opening of the church, which many people believe to be his masterpiece. When Wotruba had made his first sketches, he approached the artist and priest Josef Elter of Traunstein and wanted to tackle the project in collaboration with him. However, the landlords of the Traunstein rejected the revolutionary design and so Wotruba looked for a different partner. Wotrubakirche: "Beauty despite of Simplicity"
The Wotrubakirche was to be built in the district of Liesing, a widely neglected corner of Vienna - at least by the conventional tourist. There are huge, ugly but cheap residential areas blended with commercial zones of shopping malls with highways in between. On the edge of Liesing, the edge of Vienna meets the outskirts of the Vienna woods - here you find villas and expensive real estate, but it lacks the charm of other exclusive areas such as Döbling or Hietzing. It is a place for new money or no money. So it was in Liesing that Wotruba wanted to build what he explained as the creation of "something that shows that poverty does not have to be ugly, that abjuring can persist in an area that despite of greatest simplicity is beautiful and makes happy." Even when the building was still under construction, it attracted a lot of attention - Viennese coming on weekends to check out the progress of the work or discussing the appearance of the building. Soon it was nicknamed "Stanahaufen" (pile of rocks). And indeed, the church looks like a pile of rocks: There is no intentional front side, the 152 concrete blocks have to decoration or ornaments. The smallest one is 0.84 cubic meters big and weighs 1.84 tons, the biggest block is 64 cubic metres big and weights an enormous 141 tons. The highest block is 13.1 metres above the ground level. Wotruba wanted to build a church that invites visitors to remain and meditate. The windows consist of simple and undecorated glass and make the Wotrubakirche lighter than one would expect it to be from the outside. The bundles of light that enter the building through several of the gaps between the blocks often overlap and create changing patters. The altar is made of artificial marble and has matching chandeliers made of bronze. In the wall behind the altar, you see a crucifix made of bronze that is a cast from a crucifix that Fritz Wotruba designed for the Hofkirche in Bruchsal, Germany. Note that the Wotrubakirche Church is usually closed from Monday to Friday and that there are no significant sightseeing attractions nearby, so do plan your visit ahead of time. Information can be obtained from the official website (see below).